The California Establishment Democrats thought they had silenced the left. But last weekend, the Left did not appear to be under control. To the contrary, at the August 25-27 California Democratic Executive Board meeting, the Left appeared to be making their own deciions and not in the way the Party wanted them to go. California Democratic Chairman Eric Bauman and Bob Mulholland (the guy running the party behind the scenes) tried to subdue the left by preventing true progressives from being placed on the top policy committees: rules, resolutions, platform, and legislation. Berners who wouldn't agree to hold the establishment line were either ignored when it came to committee assignments or placed on "Voter Services," to be used as recruiting puppets for the Establishment. At the same time, various Establishment Hillary supporters obtained more than one top committee appointment, despite not having the technical or other relevant background for those appointments. Turning apples into oranges, Voter Services members are making that committee more relevant by moving it in the direction of stopping the kind of fraud and voter stalking (the targeting of voters and the changing of their registrations) that turned Bernie Sander's landslide in California support into a win for Hillary Clinton. Greg Palast has verified that Bernie would have won a landslide victory if his voters had been allowed to have their votes counted. Committee members were much less concerned about DNC claims of fraud in the general election than with disenfranchisement of millions of Democratic voters in the primaries. 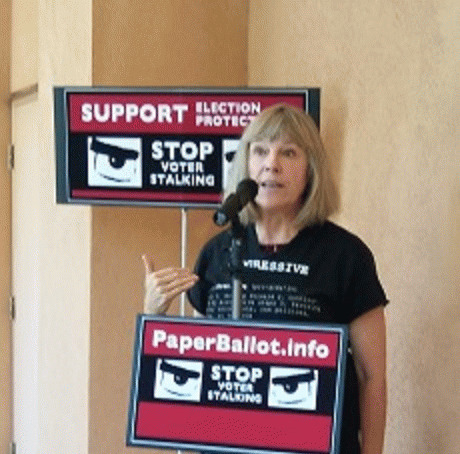 On August 26 th , Mimi Kennedy and other progressives held a press conference in front of the Anaheim Sheraton, where the E-board meeting was taking place, to call for an end to voter stalking and election fraud. It was pointed out that even paper ballot votes can be changed at the tabulator level. Hand counting of paper ballots is the preferred method for ensuring accuracy. It's tedious but less rigable. 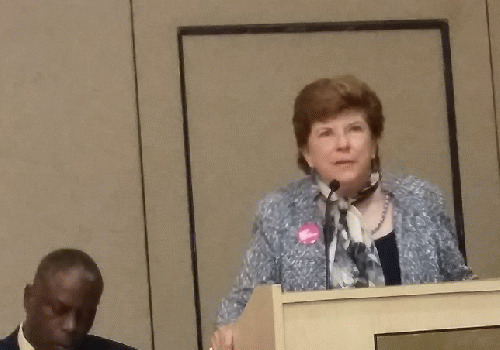 The other major surprise at the Executive Board Meeting was the popularity of dark horse candidate for Governor Delaine Eastin. When delegates learned that she was the only gubernatorial candidate who supports SB 562,they booed the position of Gavin Newsom Newsom, John Chiang and Antonio Villaraigosa on the issue. Gavin Newsom and John Chiang, who have paid lip service to supporting single-payer, both refuse to get on board with the bill to make single-payer a reality. Though criticizing the economics of the bill, John Chiang was caught on video admitting he had never read the bill, according to PDA's California Coordinator Bill Honigman. Delaine Eastin had a surprisingly very large turnout at her hospitality suite. The room was packed tighter than a sardine can with delegates continuing to pour into the doorway. One delegate said that, up until that meeting, she would never have considered backing Delaine Eastin for anything but was now switching her vote from John Chain to Eastin. She wasn't alone as many delegates stated that, if Newsom and Chiang cannot back the single-payer bill, they don't deserve to be in office. Eastin also has a plan to end private prisons and the prison industrial complex. Eastin had the overwhelming support of the Berners and the PDA membership during the weekend event. Even Eastin was surprised by the extent of her support. 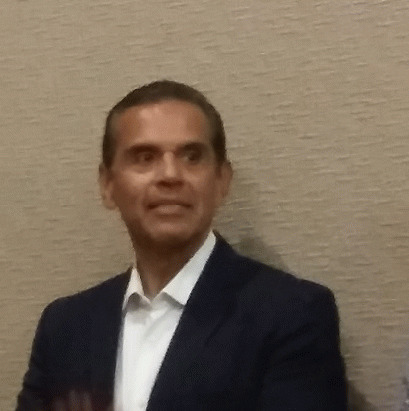 Former Mayor Antonio Villaraigosa is the newest addition to the governor's race. Angelinos who remember the brutal way Occupiers were evicted from their City Hall Park during Occupy Wall Street are not among his biggest fans. Though Newsom, part of the Pelosi family, has received the highest amount of donations so far, Villaraigosa is expected to receive the most in Wall Street contributions. At the Arab-American Caucus, a panel discussed the unconstitutionality of the anti-protest/anti-boycott bills introduced in the House and the Senate. The audience members agreed to help unseat members of Congress supporting that bill. Among the members co-sponsoring the House legislation is Lou Correa, the Congressman in whose district the meeting took place. There is an effort to get Dennis Kucinich to run against Senate bill co-sponsor Maria Cantwell in the State of Washington. Among those participating in the panel was Congressman Ro Khanna, who later asked people to get out the word that he is opposed to regime change in Syria. During the weekend, it was learned that a former progressive candidate was being targeted for removal of his credentials, simply because he backed Jill Stein in the 2016 general election. All of California's votes went to Clinton and so this came across as very punitive and served as a subtle threat against anyone else who wanted to acknowledge not voting for Clinton. Privately, about a third of the delegates said they either did not vote, did a write in or voted for Jill. A number of the delegates saw this as an attempt to suppress dissent within the party. The next CDP E-board meeting is in Burlingame in November. If this is a first round, what will happened then? 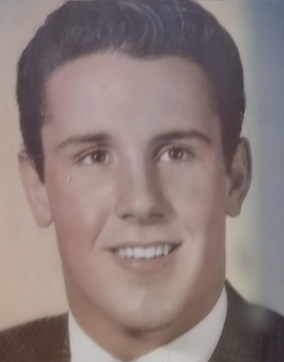 Henry has been a professor of political science and legal ethics and an advisor to many successful candidates for public office. He is currently working on a book about the inequality crisis in America. Is the Party Over for California Democrats?